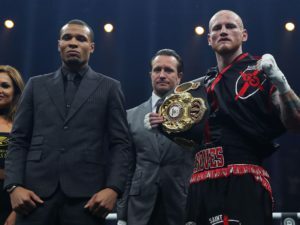 On February 17, 2018 at the Manchester Arena in jolly ole England current WBA Middleweight Champion George Groves, 27-3, 20 KO’s will defend his title against Chris Eubank, JR., 26-1, 20 KO’s. This is the second defense of his title in a little over three months, so ring inactivity shouldn’t play any role in this fight against Eubank, JR.
Across the ring Eubank, JR. who last fought around the same amount of time as Groves has, so as with George, Chris will not have any ring rust either. There is only about one year difference in the ages of both fighters with Eubank, JR. being the younger of the two. With these variables going in, Eaton Thatcher from MyTopSportsbooks.com is saying that the underdog Groves is the best bet. On paper, Groves has faced the stiffer competition, but Eubank, JR. will probably edge him in popularity come fight night which any true boxing fan knows, could play a huge factor in how a fighter in this case, Eubanks, JR. performs. We already know his father and cornerman Chris Eubank, SR. will not be quiet during the fight as he stands over his son in a custom made tailored suit yelling instructions at his charge. Groves holds recent wins over Jamie Cox, Fedor Chudinov, Eduard Gutknecht and Martin Murray. Eubanks, JR. on the other hand has wins over Avni Yildirim, Arthur Abraham and Renold Quinlan. There is not much we can take from these wins of either fighter going in, so let’s look at some other variables. Eubank, JR is more of the finesse fighter where Groves is a come forward plotting type of fighter who will be in Chris’ face all night long pressuring him. They share the same number of knockouts on their ledgers at 20, so they both can pop, but many think this fight will go to the scorecards and they are probably right in their assumption. Another stat we can look at when it comes to both fighters is their time as pros. In this area, Groves has almost three years over Eubank, JR. in the ring and that experience may play a tiny factor in how the outcome of the fight goes. No matter what we come up with as boxing analysts in variables for each fighter, most boxing pundits will agree, on paper, this fight has exciting written all over it! « What Happened to Lamont Peterson?